You are here: Home / Reviews / Gi / Choose My Gi! Break Point is doing it for me. My 3-year old daughter says the Cat Fight one because says “pink is the best…simple!”. LOL! That’s awesome Dan, thanks for sharing. Man I tell you, I am drawn to the little paws on the Catfight patch – too cute and sassy! For something I’ve not tried before it would have to be the breakpoint over the vulkan (lavendar :S). 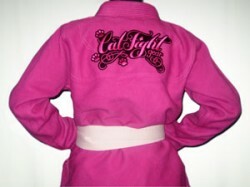 I already own a catfight gi and I love it. They are heavier than the other gis suggested so not for use in very warm weather but when the gym is cold in the winter it is my absolute favourite. I have seen people who say its hard to get in contact with catfight gear but once you get the right email address they are great!! If the verdict is Catfight, I might chase you for the best email if I need customer service, if that’s okay. At the moment it is BP, Catfight and Vulkan last (including blog, FB and G+ comments). I would have to go with the Breakpoint. I say NO to Catfight Gear, a company that stresses looking good before anything else. A poo-poo to them! 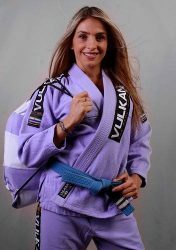 I rolled with someone who was wearing the lavender gi and I had gi envy. That thing felt awesome and looked great!